I just want the 2 hour stock recipe, STAT! I wish I could say my first inspiration was Julia Child, and that I used to watch her back in the 80’s and she was an inspiration to me as a foodie, cook, and young woman with aspirations and all that crap. Nope, Julia Child is an inspiration to me now in many ways, but she was not my first. My first interest into the culinary world, at least aside from my parents, actually came from Mark Bittman, a columnist with the New York Times. El Gallo and I bought a copy of “the minimalist cooks at home” when I was still in college and I was surprised, intrigued, and delighted that I could create nearly-gourmet dishes with just a few ingredients in no time at all. 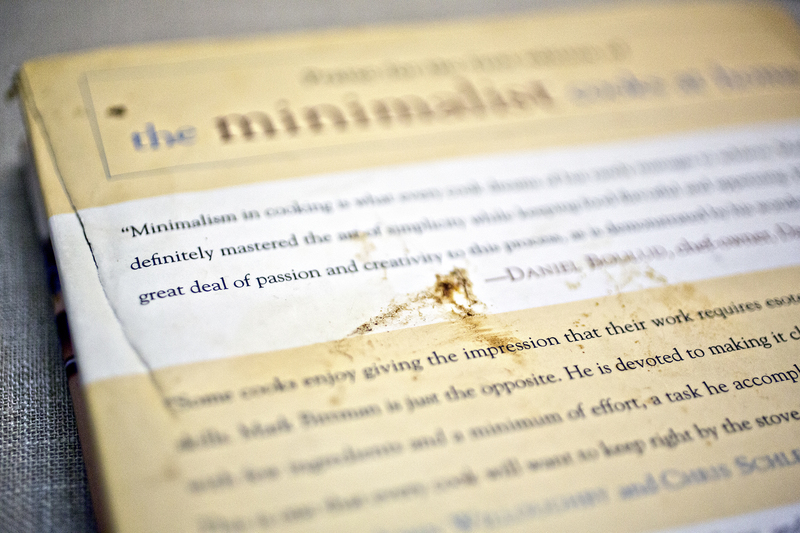 My copy of “the minimalist cooks at home” is clearly well-loved. Mark Bittman has taught me a lot; that flavor doesn’t mean a laundry list of ingredients, that a delicious dish doesn’t mean slaving over a hot stove for hours on end, to be selective in which ingredients you choose to splurge on higher quality and most importantly to read every recipe in its entirety, footnotes, sidebars and everything, before you go to the store. (There was a coconut milk incident where I thought “coconut milk” was the liquid you find inside a coconut. This dish clearly did not turn out and when looking back at the recipe I saw clear as day in the side note in bold that, and I quote, “Coconut milk isn’t the watery liquid from the inside of a coconut, but a thick cream obtained by pressing hot water through grated coconut meat.” Oops.) So I think here is where I come full circle and say thank you, Mark Bittman; as much as I love me some “girl power,” you don’t have to actually be a woman to inspire one. Moving on to today’s recipe, this stock recipe creates a rich and flavorful brown stock in pretty much 2 hours flat. Now, it does not quite yield that goopy, gelatinous result you get from a carcass in the crock pot overnight, but you can certainly put the roasted bones in a crock pot and make a roasted bones gelatinous stock (which now that I think about it, why didn’t I go ahead and do that?). Just don’t forget to deglaze your roasting pan first to get all the flavor in there. See how the bones are all brown and roasted? It’s called flavor in two hours. You can use any bones with this recipe, just keep in mind that the fouler the fowl the fouler the stock. I once threw a diver duck (aka a spoonbill aka “the worst ducks to eat”) carcass in with my other bones and it stank up my whole house and the stock was naturally gross and unusable. If your meat was particularly gamey, the stock will be too. If you spend a lot of time and spices trying to cover up the gaminess of your kills, maybe don’t put those bones in a stock and stick to more palatable animal bones, like wild turkey, elk or more pleasant tasting ducks. Preheat the oven to 450. Put the bones and meat in a roasting pan. 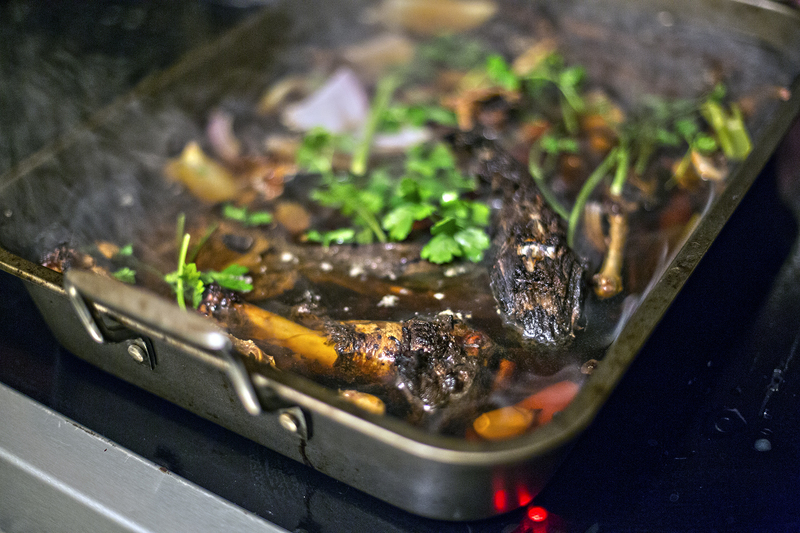 You can spray it if you want, but anything that sticks to the bottom of the pan will come up as the stock cooks. Roast the bones, stirring occasionally, for about an hour or until browned. Add the vegetables and roast for about another half an hour. Move the roasting pan to your stove top and place over one or two burners, whichever works better for you. Add water to barely cover the bones, about 12-14 cups, and put in the parsley, salt and any other herbs or flavoring you wish at this point (though I like to keep my stocks neutral until I use them). Bring to a boil, then reduce heat to medium and simmer, stirring occasionally and scraping up any stuck-on pieces from the bottom of the pan. After about 30 minutes to an hour, cool then strain the liquid. You can skim off excess fat if you choose (or keep it in there, whatever floats your fat). Non-game substitution: Any animal’s bones will do.